Diver52 wrote: I know who Inspector Havers is--I meant the horses! 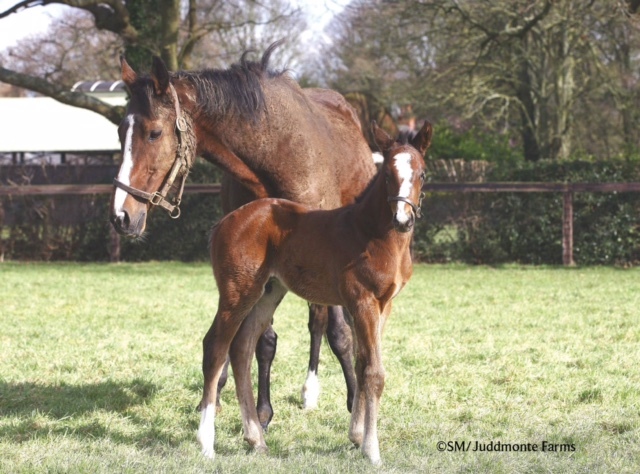 Inspector Havers is the last remaining foal before the dam was sold at the November sale. She's a full sister to Crime Lab. On a side note, Inspector Lynley is due to return to training for next season. I presume this is an homage to the late Carrie Fisher. I think it's perfect. *I assume the name is a reference to her date of birth, 1/1/16. Tiz Happarelli is wobbling between clever and horrible. Totally thought you meant the character in the book. C	BEAUTIESANDBOURBON	HOLD ME BACK	x	THIRTY EIGHTH ST. The yearlings have been named! I especially look forward to seeing Zenda's Frankel colts! There are pics of both as foals. Aww.. both have large white markings on their faces! The only son of South African champion Igugu will be trained by John Gosden and has been entered in the 2019 Epsom Derby. I will definitely cheer for this colt! The name Moose was rejected for the Congrats x Win Crafty colt. Anyone want to help me name a filly? Souper Speedy - Cherokee Lynn filly born on Valentine's day. Tried to die at three days old, had a bit of a rough start, last foal out of her dam (lost her last year) but is an absolute sweetheart of a filly. Barn name is Cora.